I love talking about this piece of speculative-fabulist fiction. I have thought of scenes or moments from the book so many times since, and find myself bringing the book up in conversation, attempting to lay out the world and its problems for whoever will listen. I fail to do it justice every time -- because something Thompson Walker does very well is layering; The Age of Miracles is, at first, our world, but layer by layer it exquisitely becomes Other. A quickie book rec fails to reproduce those layers without some serious butchering or spoiling. While reading the final fifth or so, I felt like putting down the book and clapping -- for having reached an entirely new, complex (fairly absurd) planet filled with intriguing problems I'd never considered before...in a book that started off familiar and known. I think the concept is clever, the style is engaging (I didn't want to stop reading and finished it in a day), and all of the characters have meaty depth to them. Despite the grand premise, there is some very honest content in there, imbuing the mundane with a power that hit me hard in the chest a few times (these pangs were usually the result of peer cruelty). I think the term "The Slowing" is delicious. I think it is incredible that this is a debut novel. There is some pretty mature content, for younger readers, whom I'm sure will be attracted to the young heroine and the young faces featured in marketing materials. References to middle school sexual activity, for example, would be a bit much for many middle-schoolers I know, to read. I think I would pin this for Ages 15+ (in conservative circles, i.e. my kids)...but a kid who has already seen a lot of our world's darker side won't bat an eye at 12 or 13. Some adult choices in the book are pretty affronting, so screening this one before reading alongside your own child may be the best route (I think these have potential to kick into overdrive the over-active imagination of a child already suffering from anxiety...I know a few like that). I didn't feel depressed when it was over, but I didn't feel good or excited, either. The worth of the book came a week or two later -- a slow burn. It was after some time I thought, "That really was fascinating." This isn't a terrible thing, but it isn't my preference; I prefer the immediate reward of closing a cover and feeling I have devoured greatness or I am breathless after coming back down to earth. This didn't do that for me; it finished...and slowly burned until the residual warmth got my attention. Then again, it is an End of Days tale...er...there are not all roses, by definition! Overall, I'm very happy I read it, and I think most adults who enjoy more somber speculative pieces will find some pleasure in this too. I think it's a toned-down but similar-feeling match for Station Eleven -- younger protag, less violence, single perspective -- but similar foreshadowing promises of decline and gradual progress from normal to far from it. 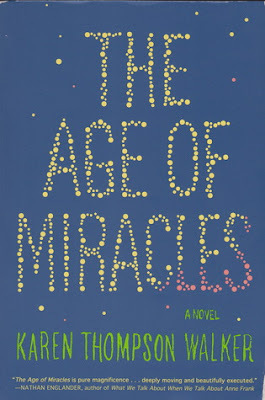 If you've already read The Age of Miracles, I'd love to hear your thoughts. If you try it soon, same same...email me! P.S. I have seen this being called dystopian. Um, I disagree -- I think it's time to quit throwing that term around. This might be deemed: soft sci fi, post-apocalyptic, speculative, fabulist, and coming of age...but I would not say dystopian.